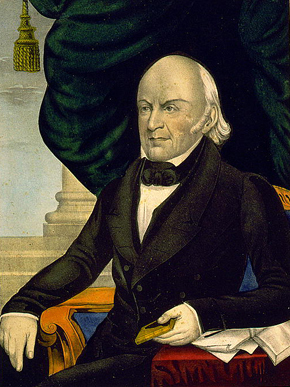 John Quincy Adams (1767-1848) was the sixth president of the United States, holding office from 1825-29. His father was second U.S. President John Adams. He held a number of prestigious titles before his presidency, including Secretary of the State. In 1824 Adams was elected president over Andrew Jackson, who felt Adams stole the election by allying with Henry Clay. Adams was elected to the U.S. House of Representatives following his presidency and served until he collapsed on the House floor and died two days later.